The previous three posts of this tutorial have introduced surface shaders and how they can be used to specify physical properties (such as albedo, gloss and specular reflections) of the materials we want to model. The other type of shader available in Unity3D is called vertex and fragment shader. As the name suggests, the computation is done in two steps. Firstly, the geometry is passed through a function called (typically called vert) which can alter the position and data of each vertex. Then, the result goes through a frag function which finally outputs a colour. The workflow, loosely described in the diagram above, sounds very similar to a surface shader. The main difference is that there is no semantic for physical properties here. Concepts such as albedo, gloss and specular are simply not present at this level. For this reason, vertex and fragment shaders are often used for non realistic materials, 2D graphics or post processing effects. It is still possible, however, to re-implement a custom lighting model within a vertex and fragment shader. In actuality, every surface shader is actually compiled into a vertex and fragment one. 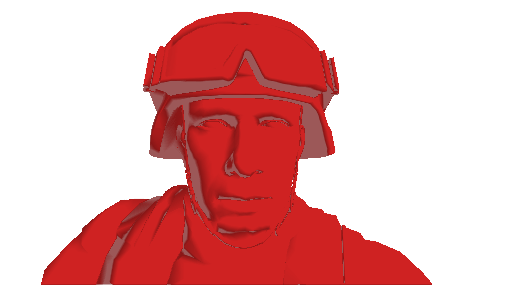 If you remember the tutorial about surface shaders, returning a red colour resulted in a diffuse red material. 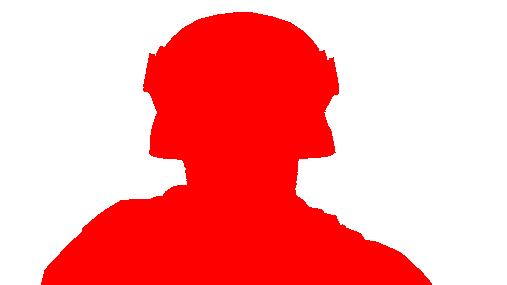 Since vertex and fragment shaders don’t have any notion of lighting, returning red here means that the entire model will be #ff0000 red, with no shades or details; just a red silhouette. Line 6-7 specifies which functions will be used for the vertex and fragment computations. Line 19 is surely the most mysterious. What vert receives is the position of a vertices in world coordinates, which has to be converted into screen coordinates. Without entering into details, this is called model-view projection. In Unity3D this is possible using a matrix called UNITY_MATRIX_MVP; when combined with the position a vertex, it returns its position on the screen. This information is packed into a struct called vertOutput and it is sent to the fragment function. Lines 10, 14 and 23 use something you might have never encountered before: a new construct called binding semantic. When a colon is placed after a variable or a function, it is used to indicates that the variable itself will play a special role. For example, this is how vertInput is actually initialised; float4 pos : POSITION indicates that we want Unity3D to initialised pos with the vertex positions. The struct vertOutput is decorated with SV_POSITION, which indicates that we will initialise it with the screen position of a vertex. Despite requiring only two values (X and Y), SV_POSITION typically contains also a Z and W components, used to store the depth (ZTest) and one value for the homogeneous space, respectively. While Unity3D will use the decorators to initialise the vertInput structure, it is our duty to fill vertOutput with the appropriate values. All the fields in both structs, however, need to be decorated with a valid semantic. Cg allows a huge variety of these binding semantics. You might never encounter most of them, so take this list only as something you need to memorise in order to understand shaders. If you want, you can rather skip to the next section of this tutorial and come back here every time you encounter a new binding semantics. This is a list of the most common binding semantics available in Cg for the fields of vertInput, according to its manual. TEXCOORD0, TEXCOORD1, …, TEXCOORDi: the i-th UV data stored in the vertex. WPOS: the position, in pixel, within the window (origin in the lower left corner). These binding semantics are one of the major source of confusion for this type of shaders. Some semantics can only run on certain hardwares and have been replaced (for instance, WPOS should be replaced by ComputeScreenPos, as shown later). With the current knowledge of shaders accumulated in this tutorial, none of the above mentioned step is possible. Yet. Some shaders are so complicated they need to be rendered multiple times in different passes. Unity3D supports a special type of pass called GrabPass; it doesn’t render anything on screen, but it captures what’s already been drawn so far onto a texture. The following shader utilises a GrabPass to take a texture and re-output it onto the screen. Basically, it does a lot of things to do literally nothing. 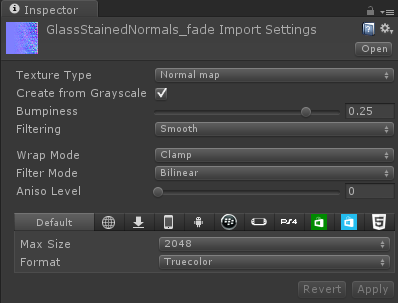 Line 4 is where the GrabPass is executed, specifying what’s on screen will be available in a texture called _GrabTexture. It’s important to remember that when sampling from a texture, its UV data is required. Since this texture wasn’t originally designed to be used in a 3D model, it has no UV data associated with it. We need to take into account the current position of the object relative to the camera; the functions ComputeGrabScreenPos and UNITY_PROJ_COORD do exactly this. That’s the standard way to generate the UV data of a grab texture and to re-map it onto the screen. There are two ways to create a normal map. The first one, is to create three separate grayscale images to be used at R, G and B channels. This however is very laborious. Unity3D provides another approach, which is based on height maps. Instead of drawing a normal map directly, you can draw a grayscale image which represents the distance of an object from the camera: white pixels are debossed and black pixels are embossed. The image above shows, left to right, the albedo map of the glass, its height map and how it appears once imported from Unity3D as a normal map. Despite being used for glass, this shading technique is perfect for other effects such as running water, the shock wave of an explosion of the air turbulences generated by fire. What we can currently do is simulating a static distortion. Water, fire and other moving materials manifest more complex distortions which are constantly moving. To do this, we need a way to add the notion of time to a shader. Theoretically this is possible by adding a _Time property which is updated every frame with the current game time. Luckily, Unity3D is already doing this. The built-in variable _Time is a packed array of length four which contains t/20, t, t*2 and t*3, respectively (where t is the actual time). If we need something to oscillate over time, we can also use _SinTime ( sin(t/8), sin(t/4), sin(t/2)and sin(t)). _CausticTex: a texture which a caustic reflection, used to give a more realistic feel to the water. Rather then relying on _SinTime, I’ve decided to use the function sinusoid for a better control. What it does is to create a custom sinusoidal wave with the known minimum, maximum and period. The complete toony 2D water shader is present in the package attached to this tutorial. As already explained, wPos, sPos and cPos don’t have a real binding semantics. However, one must be assigned to them. TEXCOORDs are usually used, even if they won’t contain any direct information on UV data. 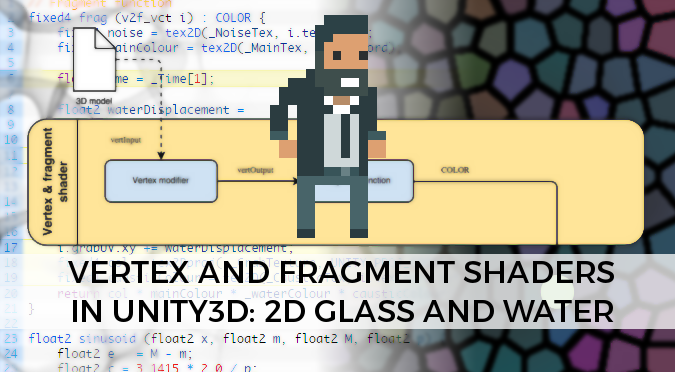 This post gives a general overview of vertex and fragment shaders, and how they differ from the previously discussed surface shaders. They can still be used to create materials which are affected by lights, but this requires a very good understanding of lighting models. If you’re interested in this, Antti Verajankorva has posted an interesting article about it. This post also introduces normal maps, grab passes and how they can be used to implement displacement effects useful for glass, water or fire. return half4(1.0, 0.0, 0.0, 1.0); ? return half4(1.0, 1.0, 1.0, 1.0); which means its white, not red.